Why Should We Use Only the King James Bible? 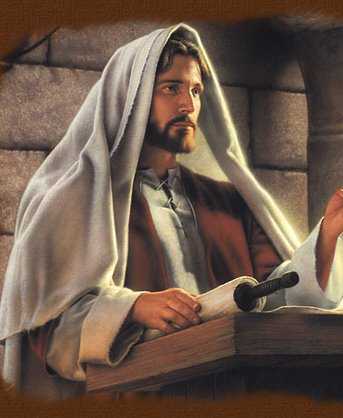 I'll tell you why, because there is no other Holy Bible!!! Although there have been several revisions (typo correction, et cetera) since the 1611 King James Bible, there have been no new translations. The so-called “New King James Version” is corrupt garbage, being translated from an entirely different Greek source (the corrupt manuscripts from Alexandrian, Egypt) than the original 1611 King James Bible (which uses the pure manuscripts from Antioch, Syria). This chart is very helpful to see the origin of all modern Bibles. I believe God's inspired, preserved, infallible, inerrant and perfect holy Word in the English Language is the magnificent King James Bible. I believe all others are imposters! Look in any modern perversion of the Bible and you won't find the word “begotten” in John 3:16. It is heresy to remove that word. Jesus is NOT God's only Son. The Bible calls every believer a “son.” John 1:12, “But as many as received him, to them gave he power to become the sons of God, even to them that believe on his name.” I am an adopted son of God, and so are you if you are saved; but Jesus is the only BEGOTTEN Son of God. Jesus is literally God's biological Son. If it seems like a trifle matter to you that wicked people have corrupted the Bible, then you need to get saved or get right with God as a believer. I can show you HUNDREDS of examples just like this where wicked translators have butchered the Bible and rendered a false interpretation of the Scriptures. To me, the humdinger atrocity of them all is what the NIV does to John 3:16. The word "begotten" is missing, gone, zilch. God has many sons (i.e., all believers are adopted children—Ephesians 1:5); but God only has one "begotten Son"—Jesus Christ. By removing the essential word "begotten" from John 3:16, the NIV corrupts the Word of God into a lie. Jesus is not the only Son of God; He is the only BEGOTTEN Son of God, because every believer is an adopted son of God. The NIV is woefully attacking the deity of Jesus. Thus, the NIV goes into my garbage pail! My mother didn't have a college degree, but she knew the Bible was God's Word. She didn't know any Greek, but she had enough sense to know that the Word "begotten" belonged in John 3:16. She wasn't a scholar, but she knew that, "God was manifest in the flesh," made a whole lot more sense than, "He was revealed in a body." It's common sense folks. It doesn't require a knowledge of the Greek to discern the truth, just a love of the dear Savior. Don't tell me you love Jesus if you choose to continue using an NIV after reading this. Why Would Anyone Use the NIV? God knew in His divine foreknowledge that English would fast become the international language of the End Times. The world has 7,000 languages and another language vanishes from existence every two weeks. English is quickly becoming the international language. Our wise and omnipotent God knew what He was doing when He gave us the precious King James Bible in 1611. There will never be another translation of the Bible, because there doesn't need to be. All modern versions dishonor the Lord Jesus Christ by diminishing His deity, attacking the Godhead (they completely remove the word “Godhead” in Acts 17:29, Romans 1:20 and Colossians 2:9) and even claiming in Philippians 2:6 that Jesus couldn't grasp being equal with God the Father. Did you know that the King James Bible contains dozens of references to people bowing in worship to the Lord Jesus Christ? Deceitfully, in the NIV, every mention of the word "worship" has been changed to the word "knelt." How wicked! How deceitful! You see friend, you can kneel before a dignitary without worshipping him; however, the King James Bible tells us that these folks WORSHIPPED Jesus!!! Only God is worthy of worship (Isaiah 42:8). Do you think Jesus is pleased with a new Bible version that removes every mention of “worshipping” Him, and instead uses the neutral word “knelt” (you can kneel before a king, but that doesn't mean you're worshipping him). The King James Bible says that people WORSHIPPED Jesus, like the leper in Matthew 8:2, “And, behold, there came a leper and worshipped him, saying, Lord, if thou wilt, thou canst make me clean.” It is wicked to change the word worshipped to knelt. If you're so foolish and blind after being warned that you cannot see what Satan is doing by CHANGING the Bible into a lie (Romans 1:25), then you are your own worst enemy. I hope and pray that you my friend will start using only the King James Bible if you haven't already. If you use a corrupt Bible, then everything that you believe is going to be corrupted also. It's like the buttons on a shirt, if you get the first button wrong then all the other buttons will be wrong too. Amen! If I am to live by “every word of God,” then I need an EVERY WORD Bible!!! Understandably, translations in varying languages won't contain the same exact number of words, BUT a genuine translation WILL at least convey the original meaning of the original language. This is the beauty of the King James Bible. The translators were so careful with their translating that they dare not add anything without allowing us to see exactly what they added. Hence, we see italics throughout the King James Bible. The italics were added because the translators thought it essential to properly convey the true meaning of the original languages. Modern translators are not as ethical, taking it upon themselves to decide what the Bible says. Please understand that translations are not inspired; but rather, God's WORDS are inspired. Psalms 119:89, “For ever, O LORD, thy word is settled in heaven.” The originals are in Heaven! Some wayward preachers, Bible teachers and pastors foolishly deny the inspiration of the King James Bible. If the original words in the original Greek, Hebrew and Chaldean (Babylonian, the book of Daniel) were inspired (and they are), then how can their translation into another language not be inspired? Again, it is the WORDS and not the TRANSLATION that is inspired. Thus, the King James Bible is absolutely inspired, because the WORDS of God are always inspired (i.e., God breathed). God's Words don't lose their inspiration just because they are translated into a different language (if it is a faithful and accurate translation). You have the inspired, trustworthy, infallible, inerrant and preserved, Words of God in your precious 1611 King James Bible. Note that there have been numerous typo revisions since the 1611 completion of the King James Bible, but there have been NO new translations of it. The so-called “New King James Version” is a piece of filthy trash, originating from the corrupt Greek of Alexandria, Egypt. This is the corrupted manuscripts from which heretics Westcott and Hort gave us all the corrupted modern Bibles. In sharp contrast, the faithful and preserved King James Bible was translated from the reliable Greek manuscripts in Antioch, Syria (where the believers were first called “Christians,” Acts 11:26). This flow chart shows the source of all modern Bibles. My friend, you ought to join me jumping up in down in heaps of joy, rejoicing in the Lord and praising God daily for the precious KING JAMES BIBLE. The King James is not “a version,” it is the BIBLE!!! Amen and amen! The argument nowadays is over which Greek and Hebrew sources are reliable. Some say that Westcott and Hort's Greek Bible, based on the Egyptian Alexandrian Manuscripts are reliable. By the way, the Jehovah Witnesses use Westcott and Hort's Greek for their New World Translation. Others say that the "Textus Receptus" (or received text) from Antioch Syria is the reliable text. Our precious King James Bible comes from the “Textus Receptus.” By the way, all of 1st John 5:7 is found in the Textus Receptus! There are over 5,000 ancient manuscripts of the Holy Bible available today. The majority of those manuscripts AGREE with each other, which became known as the “majority text” or “received text.” The Alexandrian manuscripts are in disagreement with the majority texts, and are called the “minority text.” They are the texts which were REJECTED by the skilled translators of the beloved King James Bible. There is safety in numbers. Read This All You King James Bible Critics... And Then Read It Again! Only The King James Bible Uplifts And Exalts The Deity Of Jesus Christ! No other "so-called" Bible available today uplifts and honors Jesus Christ as much as the King James Bible. The King James honors Jesus Christ for Who He truly is—God Almighty. 1st Timothy 3:16 has been horribly perverted in the New International Version (NIV), I can't imagine why any true Christian would even consider using an NIV. 1st Timothy 3:16 in the King James Bible says, "...God was manifest in the flesh..." Do you know what the Devil's crowd has reduced it to in the NIV?, "...He was revealed in a body..." Anyone with a low IQ can see that something is very wrong with the NIV. Though some foolish people have claimed that this promise of preservation refers only to the saints (rather than God's Word), it couldn't be more obvious as to what the Bible is promising here—"The WORDS OF THE LORD are pure." How pure?—"As silver tried in a furnace of earth, purified seven times..." WOW! What a contrast from the lame mumbo-jumbo introduction in the front of the NIV bible. Read it for yourself! You'll also find that the "committee" (God spare us from more committees) chose to assemble a bible which was "not based on 'sectarian-bias.'" In other words, they wanted to reach a very large customer-base, so they watered down God's Word to make their translation as ecumenical as possible. I've never met a soul-winner who wasn't a King James Bible-totin' fool for Jesus. Count me in!!! I wouldn't be here today if God's grace hadn't seen me through the years. I thank God with a debt of gratitude which cannot be adequately expressed in words for the precious King James Bible, it has become my life. And may I say, the Bible does not contain the Word of God, the Bible is the Word of God!!! I feel sorry for those who are still walking in the dark concerning the truth of God's Word. There are many phonies in the church today. I'm certain we'd be shocked if we knew just how many professed Christians are actually unsaved. Nearly every false religion claims the name of Christ; but they are ministers of unrighteousness. The Jehovah's Witness' cult even teaches people to accept Christ as their Savior. Yet they are teaching people to accept a false Christ who is not God Almighty. Jehovah's Witness believe that Michael the archangel became Jesus. They believe Jesus never rose bodily from the dead. Have you seen the Son? The True Son of God, Who is Almighty God! What is the will of God to be saved according to John 6:40? First, you must "SEE THE SON." You can believe on a fake Jesus if you want to, but you will be ashamed (disappointed) someday! You will go to Hellfire. Second, you must "BELIEVE ON HIM." That's it friend! To be saved, you need only to come as a hell-deserving sinner to God of the King James Bible, Jesus Christ, and believe on Him for the forgiveness of your sins. Phooey on the New International Version's (NIV) watered-down Jesus. Philippians 2:6 in the NIV actually lies by saying that Jesus is NOT God. Phooey on the Jehovah's Witnesses' Jesus who is only Michael the archangel become a man. 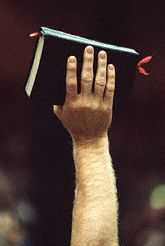 The Bible teaches that GOD BECAME MAN (1st Timothy 3:16; John 10:22; John 1:1-3,14). If you have a King James Bible, then you're safe doctrinally; but if you have a modern corrupted Bible, then you're in BIG TROUBLE (especially if you weren't taught from the King James Bible when you were younger)! People who get saved today and have never seen a King James Bible are totally at the mercy of the Devil's modern corrupted Bibles. For example: As mentioned earlier, the word “GODHEAD” is mentioned in the King James Bible in Acts 17:29, Romans 1:20 and Colossians 2:9; but all modern perverted Bibles completely remove the word. Since the word “Trinity” is not found in the Bible, the word Godhead becomes all that much more important. To Hell with all modern corrupted Bible versions! Give me the old, trustworthy, inerrant, preserved and inspired, precious KING JAMES BIBLE!!! Phooey on the Jesus of Catholicism who is no greater than Mary in their false religion. Phooey on the Muslim Jesus who was merely a prophet. Blessed be the name of the true God—Jesus, King of kings and Lord of lords, Eternal, Everlasting Father (Isaiah 9:6) and Almighty God (Revelation 1:8). Yes, for me there is ONLY one Book, the Old Book, the precious King James Bible! The King James Bible Defended! Why Do We Support only The King James Bible For the English people? SOURCE: What Is That Book You Hold In Your Hand?, by Dr. Shelton Smith, editor, Sword of the Lord.